SRB10 Features: -Replacement blades for safety scraper for glass. -Standard No. 9 (1.5'') razor blades or 4'' or 6'' replacement blades. -Works well in scraper with locking system that eliminates blades from sliding out while working. 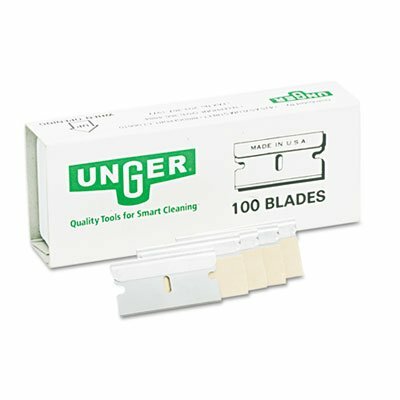 -Replacement blades are individually wrapped to prevent rusting. Product Type: -Blade. Blade Shape: -Straight-Edged. Quantity: -Set. Generic Dimensions: -0.1'' H x 0.1'' W x 0.1'' D. Dimensions: Overall Length - Top to Bottom: -0.1 Inches. Overall Width - Side to Side: -0.1 Inches. Overall Product Weight: -0.2 Pounds. Sharp, stainless steel razor blades. Convenient, safe clamshell packing.